I am a fan of a good cheeseburger. I know--red meat is bad for you, a heart attack waiting to happen, congregates in your colon, etc. It's not like I've never listened to the stories. I even tried being a vegetarian for a bit, until my body made it very clear to me that I was made to be an omnivore. I've accepted it. Embraced it, even. So the occasional cheeseburger is part of my diet. I salivate at the idea of a cheese-covered burger held between a hamburger bun. San Antonio has more than its fair share of burger joints, and I've tried to visit all of them at least once. I am perfectly comfortable dining solo, so if nobody cares to join me, that's more cheeseburger for me. The Bracken Store Cafe is a what we in Texas call a hole-in-the-wall. These sorts of establishments used to dot the entire state, but they're a dying breed now. It took me months to find the place; although everyone I knew had eaten there, no one could tell me exactly how to get there. Once I found the right side street, I nearly missed the place yet again. The building used to be a gas station once upon a time, and it still looked the part. I went inside. For those who have never been to one, hole-in-the-wall burger joints are not fancy places. They are not pretentious places where people pay thirty bucks and up for a tiny plate of odd fluff. Hole-in-the-wall burger joints are places where it is all right to put your elbows on the table, pick at your teeth with a toothpick, and slurp your tea. Everyone is accepted, no matter their dress, and everyone leaves satiated. I walked up to the counter and said the secret word, "Cheeseburger." There were thirty people behind me, impatiently waiting to order. I knew that if I slowed down the line for something silly like "no pickles", I'd be strung up the nearest tree by my toenails. I paid, got my glass, and headed for the drink stand to get myself a tea. Then I sat down. A tiny place from a bygone time, the Bracken Store Cafe did not look like a place to eat. And yet, once I was inside and seated, I found a comfortable, cozy feel, as if I'd been eating there my entire life. There was a smell of home style cooking wafting up into the rafters from the open grill. I passed the time looking around at the bits and pieces of nostalgia adorning the walls, including pictures of the kids in the local 4H club with their animals. The burger was an inch thick and covered with gooey cheddar cheese, lettuce, tomato, onions, pickles, and mayo. Perfection. I dug in with gusto, my elbows on the counter, a starving woman at a Las Vegas buffet. I ate until I could eat no more. I am not ashamed to say that I could not finish it. The joy is in the journey, not the destination. P.S. Bracken, Texas, is also the location of the largest bat colony in North America, with over 20 million bats. Bats do not eat cheeseburgers, thank goodness! i LOVE little hole in the wall places like that. The food is usually so amazing. I agree with MJ, we had a place in the town I grew up in called THE CARAWANNA and oh dear baby jesus, their food was full of grease and calories and cholesterol, but I still dream about their hot dogs and burgers. I love knowing that you love a good burger too...it shall be our "lunch" when we finally meet . so well done, in language and memories. I want to go with you! I love hole n the wall places. I've discovered 3 such places in our new home town. Mmmm, cheeseburgers. I love them. This reminds me of Rudy's in Austin; bbq, but the same sort of vibe. 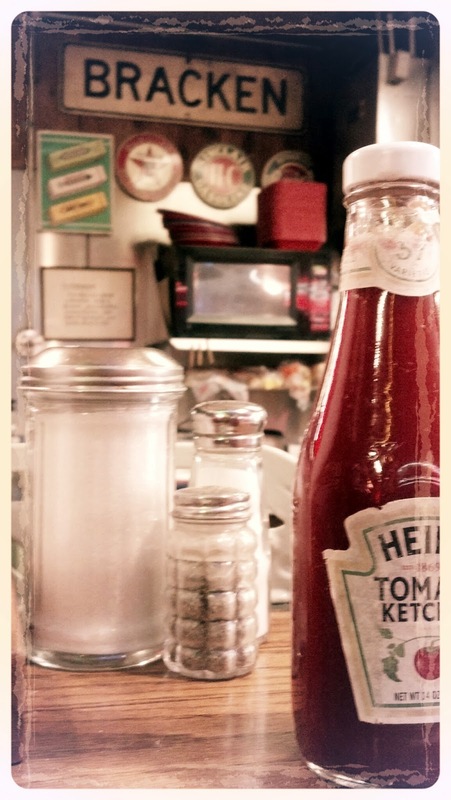 Miss Florence Diner in MA. Ask any vegetarian what they miss most...bacon or cheesburgers. Sounds like heaven on a bun... I too am a fan of red meat! Oh yum. Hole in the wall cheeseburgers are a real weakness of mine. If you're ever near Houston, I can tell you about a few. Two things I love! Hole in the walls and a big, fat cheeseburger! Love the journey...almost anywhere. Fabulousness! Those little greasy spoon hole in the walls are the best!